All the fun of our 4 hour trip plus more! Charge through the class IV Sabretooth Canyon, hike to the base of a waterfall in Wells Gray Park and enjoy 28km of sheer excitement on the Clearwater River. 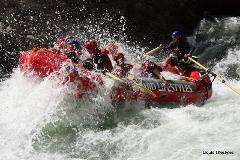 4 hours and 14 km of non-stop river rafting through Clearwater's Granite and Lower Canyons. Our family friendly whitewater rafting trip is designed to give you a taste of what the Clearwater River has to offer. 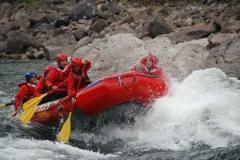 Two jam-packed days of whitewater rafting excitement and unparalleled scenery await you. This expedition covers 150km and is an entire week of camping, rafting, hiking and exploration. 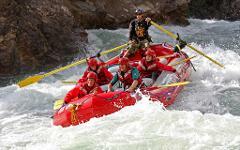 Take on the Clearwater River, Quesnel River and Cariboo River (Chilko and Chilcotin). This action packed 5 hours includes a trip through the class IV Sabertooth Canyon right down to the Granite Canyon. Includes lunch on the river.